Washington isn’t called the Evergreen State for nothing — the state is filled with greenery, from ferns on the forest floors to towering Douglas firs (the tallest tree in the country just behind the Sequoia). Beyond providing natural beauty galore, Washington State’s forests are perfect places for hiking, camping or photography. Or simply find a place to sit and connect with nature among the trees. Washington State forests are predominantly evergreen, filled with firs and pines, lush moss and leafy ferns. Whether you live in the state or are visiting, taking some time to recharge in some of the most beautiful forests in Washington is the perfect way to enjoy one of the things the Evergreen State does best. While some of the local forests are far out from the cities, not all are. Case and point — Capitol State Forest less than an hour south of Olympia (which is, in turn, a little over an hour south of Seattle). The forest spans 100,000 acres and is crisscrossed with trails for hikers, mountain bikers, horseback riders and off-road vehicles. Within the forest lies a small ghost town called Bordeaux that can be tricky to find, but its elusive nature makes it fun for explorers to track down. And if you can’t find it, you might run into a waterfall or find a meadow filled with wildflowers. Just outside the forest are the Mima Mounds, one of Washington’s more unique natural formations. You will need a Discover Pass to visit the forest. Mt. Rainier National Park is not far from either Seattle or Tacoma and about half the park is covered in forest, both old and new. Trees include towering Douglas firs, mountain hemlock, ​and Alaskan yellow cedar. Because the park includes low and high elevations alike, these forests include a wider variety of trees than many other forests in the state. There’s also a huge range in terms of age, from trees as young as a few decades to old growth forest that are more than 1,000 years old! You can spot some of this old growth at the easily accessible Grove of the Patriarchs, which is a hike for all levels close to the Ohanapecosh campground. Some of the trees there have circumferences greater than 25 feet and some are more than 1,000 years old. Olympic National Park is known for many things — rugged coasts, a towering mountain range and forests. 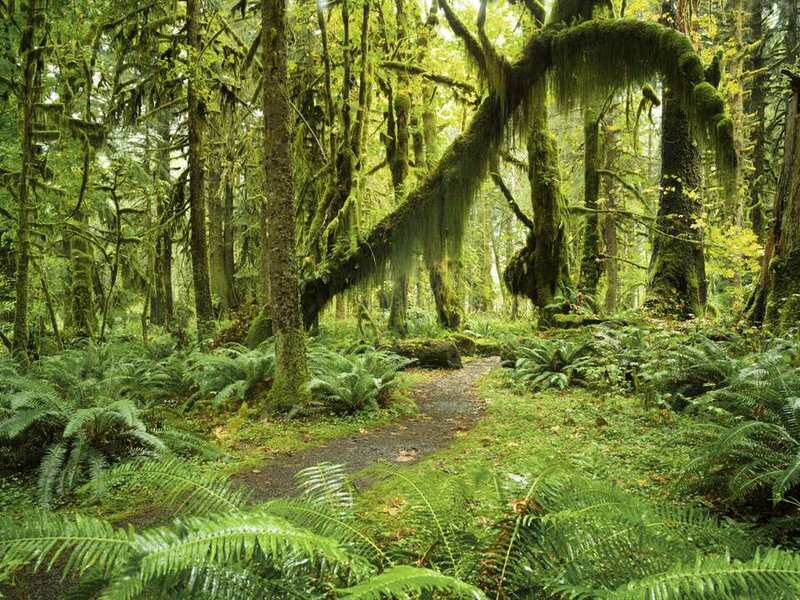 Unique to this park on Washington’s peninsula is are temperate rainforests — the Hoh and Quinault rainforests — that are very likely the wettest places in the continental US. Wandering these forests might just make you feel like you’re in a fairytale with their towering old growth trees, lush ferns on the forest floor and moss literally hanging from the tree branches. Exploring either of these forests goes well with an overnight or two in the park. Stay at the Lake Quinault Lodge to be in close proximity to the Quinault Rainforest and its ample trails, or Kalaloch Lodge to explore the Hoh Rainforest. Both rainforests have trails long and short, easy and tough. And both lodges are warm and cozy and feel like you’re a million miles away from the modern world, which is just how you should feel if you’re spending time in a forest. Okay, so this forest is a little different than your average Washington forest. You won’t find the kind of old growth you’d expect at other forests. You won’t even find a lot of greenery. This is a forest of fossils of petrified trees from thousands of years ago. In addition to trails with fossilized logs left where they were first found, there’s also an interpretive center with different types of petrified wood on display. If you’re passing through or if you find yourself needing more than a day, you can camp at the Wanapum Campground located within the Gingko Petrified Forest State Park. Two peas in a forested-park pod, Point Defiance in Tacoma and Discovery Park in Seattle are both large, forested urban parks. If you can’t venture out of the cities, both of these parks feature lovely Northwest greenery at its finest and even old-growth forest right within the city limits. Point Defiance Park, for example, is home to a giant sequoia that dates to the 1600s. It’s marked with a sign along Five Mile Drive. Both parks have tons of trails as well as places to relax along the water, viewpoints and open meadow areas too.